Fixed by Code: XE7 - already new version of Delphi - again!! 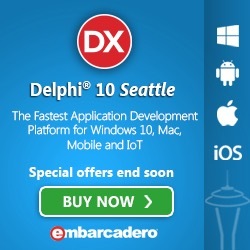 XE7 - already new version of Delphi - again!! ...or why you should consider getting a software assurance license, use the recharge option or just try out the newer versions of Delphi. Delphi has at a point in time been rumored dead - and many abandoned ship to, at that time, more popular languages - but I guess perseverance will prevail. - Readability and maintainability - code is written once, but read many times. - Code backward compatibility - some vendors even break that with every version of their IDE. - Many new language features that keeps the language fresh and "modern", without "breaking" old habits. - Multi-platform native code - not any "virtual" machines, runtimes or heavy framework dependencies. - Inter-operable with any other technology on the supported platforms - there is "almost" nothing you can't do. - Frequent updates - twice a year - with possible hotfixes in-between when needed. - Best usage of my skill set. - Strong and growing community. I was recently asked to convert an old library, written in pascal and compiled in Delphi to C# - it would had made more sense to re-factor and optimize the code - but the people who needed the code had different language preferences. By converting the simple code, the library actually ended up with more "outside" dependencies and were more tied to a specific platform - than is was originally written to. The same code was running on PalmPilots and Handspring devices back then - used the PocketStudio product and Delphi. I did tend to use the "official" language when developing for Android - but I am really happy I can now stay in my IDE of choice. The theoretical nature of that language doesn't really suite my nature. When doing Apple related stuff, I did bring down my NeXTSTEP Developer's Library books purchased back in Summer 1993, noticing that Apple had mostly only changed the cover for the Objective-C reference - but the IDE broke my code by every update, because of added language features. Well Apple hardware is being "Swift", but I am not sure my Objective-C code will stay that for that much longer. There are many languages out there - and they have all various purposes in life - and like spoken languages - knowing multiple will make you horizon wider - some solutions could benefit from as an example combining a compiled language with a scripting language. I actually at a point in time considered "abandoning ship" or at least skipping versions for a while - not because of the more hyped "languages" - but because of the upgrade cost, missing road-maps and free alternatives. But then I thought better of it - because I prefer to code less, and don't want to spend endless nights reading RFCs on various protocols and stuff I might only need once - I need to pay myself first. So you could spend some hours on doing a REST client by hand, or just use something like the REST debugger mentioned in a previous post, for 10 minutes - as long as the component and Object Pascal languages developers at Embarcadero keep making my life easier, I will keep my versions updated. And the best way to keep the upgrade cost down is to either buy a Software Assurance when you upgrade and maintain that, or use the new recharge option. I think Borland/Embarcadero should have been promoting the Software Assurance better back then - I always only got the 3 support incident part - well who needs support :-) - a lot of money was spent on upgrades back then. I was writing this post while I was listening to a great Skill Sprint webinar by Cary Jensen and installing XE7 - which since there is so much stuff in there takes too long (the installation - not Cary). Looking forward to a fast install, with partial updates. Thanks for what seems like a great upgrade - the FireUI Multi-Device designer is a very helpful addition. To take a look on What's new in XE7, go to the XE7 landing page - here. I will be back with some more technical posts - some might even be XE7 specific - so if you still are using versions prior to XE2 or did abandon ship at a point in time - upgrade or try the trial - since a lot has happened during the last couple of years.